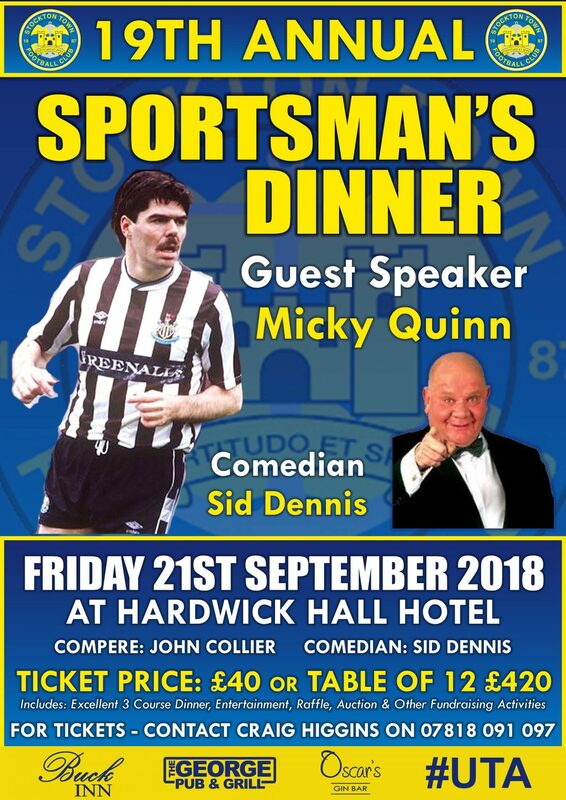 The Club is delighted to announce the Guest Speaker for our forthcoming Dinner, the ex Newcastle United star and Talksport presenter Mick Quinn. We will also have the outstanding comedian SId Dennis to entertain you and his Scrap Man act is one of the best on the circuit. Our compere for the evening will once again be John Collier who so brilliantly did our Dinner last year. All proceeds from the Dinner will be committed to our ongoing Club development that will ultimately aid the long term sustainability of our Club and provide a first class facilities for the community in general.The support of the local business community and our dinner regulars is vital to the ongoing success of Stockton Town FC. We really hope you will be able to support us again this year.